Tristan graduated from Manchester University with a Bachelor of Dental Surgery in 2001. After working in general practice, Tristan returned to hospital, to work in an Oral and Maxillofacial surgery department. He gained valuable surgical experience alongside his membership to the Faculty of Dental Surgery from the Royal College of Surgeons, England. Over the last 10 years he has gained experience working in mixed NHS/private practices. 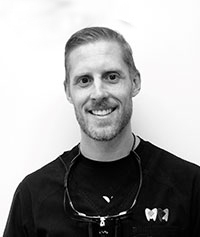 During this time in dental practice he has continued his professional education, including a certificated course in Oral implantology, and a diploma in restorative dentistry, both awarded by the Royal College of Surgeons. Tristan enjoys all aspects of general dentistry. He aims to provide his patients with the optimal experience in what is often an extensive and lengthy process. His ethos is of a relaxed but comprehensive attitude in providing the best possible care in a comfortable environment. Tristan emigrated to New Zealand in 2011 where he worked in Hawkes bay. Tristan has moved to Auckland with his wife, Emma and 2 children, Elliot and Isla. Out of the surgery, Tristan enjoys spending time with his family, the outdoor Kiwi lifestyle, coaching pre-school Rugby, and playing golf. I'm normally reticent about giving reviews, and am super fussy about dentists - I tried five different ones on two continents before discovering Tristan, Karen, Jas and Mel. Tristan has just replaced a dead bottom incisor for me and although it has been a long process I'm totally happy with the result. Throughout he was thorough but deft and quick so that I didn't have to experience any more than the minimum discomfort. Like all the other five star reviewers on here I have nothing but praise for the whole team - highly recommended!